The growing number of networks delivering healthcare, and professionals learning together to improve care, has created a need for new kinds of management and leadership. 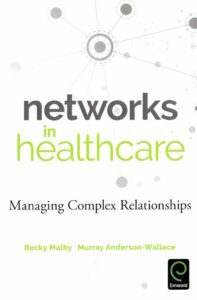 Co-authored by Murray Anderson-Wallace and Becky Malby, this timely publication highlights key lessons for network leaders, in a world where care must increasingly be managed through partnerships and networks as a response to complex health needs requiring better solutions across health economies. Written for health and social care professionals wanting to set up or currently leading a network, Networks in Health Care is practical, informative, theoretically grounded and written by two leading experts in the field. This book will also be useful for academics teaching health care leadership. It includes practical diagnostic materials and up to date international examples. The book can be purchased via Amazon, the Book Depository and Waterstones.